I’m a big fan of today’s guest blogger. I’ve known his dad, Kent Odor, who we affectionately call Small Group “Yoda,” for years, and he’s been a great encourager, mentor, friend, and coworker. His son Micah has the same kind of traits. Micah has made it a regular practice to sit in on workshops I’ve led at various events, and he is never timid about asking questions, making comments, sharing his own ideas, telling stories about his small group experiences, telling stories about stuff that has nothing to do with small groups . . . Micah can talk, but here’s the thing: most of what he says is laced with wisdom. Today’s post is no exception, except I kept him to about 500 words. GUEST POST by +Micah Odor. Micah leads groups and group leaders at Whitewater Crossing Christian Church, just west of Cincinnati, Ohio. Follow him on Twitter @micahodor. I’ve been leading small groups and small group leaders nonstop for more than 20 years. 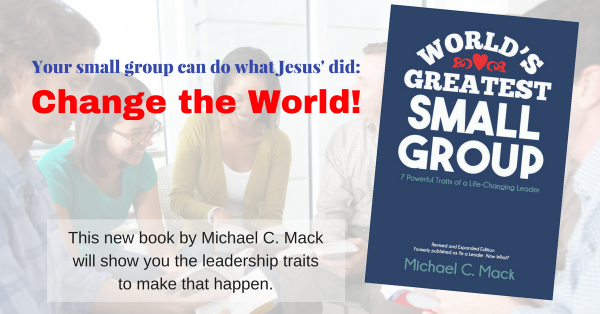 In that time, I think I’ve made almost every mistake you can make leading a small group. My biggest weakness? I talk too much. Here’s a simple trick that’s helped me a lot.… I hope it’s helpful for you, too. It’s important to ask good, open-ended questions. Nobody will discuss something that can be answered by a yes or no. If they can raise their hand and answer “Jesus” or “The Bible,” your questions need some work. But even with good questions, sometimes it’s hard to get the group to engage. For most group leaders, there’s nothing worse than an awkward silence. We ask a question, we wait on pins and needles for someone to answer, and the longer we wait the more uncomfortable we get. Eventually we answer our own question “just to keep the conversation moving.” We think that by going first and modeling a good answer, we can get the rest of the group to follow us. Sometimes this works, but often (usually) it just teaches the group to wait for your answer. After you ask a question, don’t say a word until you’ve (silently) counted to six. If you’re leading a group, you have to remember that most of the people in the group are far less worried about the silence than you are. For you, silence feels like failure. For them, silence is the time that they’re using to process your question. I’ve seen many group leaders that get uncomfortable after four seconds; some after just two. When I asked them how long they gave their group before they broke up the silence, most of them had no idea. But on average, people need at least six seconds to process a question and come up with a good answer. I mean this very literally: if you’re the type that answers your own questions, don’t do it until you’ve said to yourself “One thousand one, one thousand two, one thousand three, one thousand four, one thousand five, one thousand six.” But what if they don’t answer by then? If you don’t get an answer in six seconds, try to rephrase, redirect, or retreat. If people won’t meet your eye, then maybe they don’t want to go first. Redirect the conversation by steering away from a question to the group and direct it instead toward a specific person. Try to pick someone who won’t hate you, of course, but gently drawing people out doesn’t have to be dramatic. Often someone who’s nervous talking to “the group” will be far more comfortable talking directly to you. If all else fails, retreat. Don’t double down on a bad situation. If the group is completely unwilling to engage, you need to move back a few steps and break some more ice. Spend some more time on story-telling and affirmation first! But that’s a topic for a different post.